John’s will, dated 6 October 1916, was very simple.1 He left $1 to each of his children: Peter Burgraff, William Burgraff, Maggie Den Adel, Elizabeth Dyksterhuis, John Burgraff, Jane Burgraff, Hugo Burgraff, Albert Burgraff, Arie Burgraff, Bastjaan Burgraff, Marion Burgraff, and Sadie Burgraff. The rest of the estate went to Mary and clearly stipulated that she could do what she wanted with it. He also named her as executrix of his will. I did not search out the probate files to look for an appraisal of the estate. Peter and William (sons of John and Elizabeth) each received $500. This would be payable after the sale of real estate, but before the division of proceeds. Everything left would be divided equally between: John Burgraff, Hugo Burgraff, Albert Burgraff, Arie Burgraff, Bastjaan Burgraff, Marion Burgraff, Maggie Hoekstra, Elizabeth Dyksterhuis, Jane Nymeyer and Sadie Burgraff – to share and share alike. There is one exception made to the property. Mary requests the courts appoint her brother Hugo Kortlever as guardian of the minor children: Arie, Bastjaan, Marion, and Sadie. Interesting tidbit 1: Hugo and Albert are nominated as the executors. John Jr. is not named. She also provides a separate sum of $200 each for their services. It sounds like John was persona non-gratis at this time. Several phone calls later I was able to determine that Mary wanted the boys (Hugo and Albert) to be able to ask John to leave. John was not a farmer and contributed little to the working of the farm, although he lived there and apparently did not hesitate to partake in all the benefits. He did not work much outside the home, but he perceived himself to be the wheeler-dealer that his father was. Sadly, according to my sources, John lacked the temperament and talent for this. Mary made it clear that she was aware of the problem and would not saddle the other children with a sibling that wouldn’t pull his weight. On the 1930 census Hugo age 28, is listed as the head of the family and at home are: Sadie age 17, Bert age 20, Marion age 19, and at the end of the list is John age 31.3 Apparently Hugo did not ask John to leave. In 1929 William entered an agreement with his grandmother Maaike Flora Bel Kortlever. She provided him the cash he needed and he signed away his $500 that would be coming with sale of the land. Her son Hugo Kortlever acting as executor, claimed her share after her death in 1931. In 1934 Bert sold his share of the farm to his sister Sadie. John’s shares (according to the 31 Jan 1936 document) were sold under Sheriff’s sale to satisfy a judgment at some time prior to that date. 1. Whatcom, Washington, Record of Wills and Probate, Vol 8 of the Whatcom Probate Index: p. 79, Will of John Burgraff; File No. 4445. 2. Whatcom, Washington, Record of Wills and Probate, Record of Wills, Vol 8: p. 237, Will of Mary Burgraff; File No. 5979. 3. 1930 U.S. census, Whatcom County, Washington, population schedule, Ten Mile Township, enumeration district (ED) 53, p. 7A, dwelling 165, family 165, Hugo Burgraff; digital images, Ancestry (http://www.ancestry.com: accessed 7 Jul 2009); citing National Archives and Records Administration microfilm T626, roll 2522. 4. Whatcom, Washington, Probate Files, 5979 – Mary Burgraff; Superior Court of the Sate of Washington, County of Whatcom, Bellingham, Washington. Mary stayed busy after John’s death raising her family. The boys were taking care of the farm and the three older girls were married and busy with their families. In August of 1921 Mary was appointed to the board of the drainage improvement district. Her son John Jr. had applied for the position, but he was not a land owner at the time which made him ineligible for the position. The judge appointed Mary.1 She remained on the board for several years. Funeral services were held on Monday at 1:00 p.m. at the Burgraff home and at 2:00 p.m. at the First Reformed Church for the late Mrs. Mary Burgraff who passed away Friday. Rev. P. Jonker and Rev G. DeMotts were in charge of the services. Mary Kortlever was born October 17, 1874, in Holland, and died at the age of 51 years, 5 months and 29 days. Mary is buried beside John in Monumenta Cemetery. 1. “Local News,” The Bellingham Herald, 16 Aug 1921, p. 5; digital images. 2. Whatcom County, Washington, death certificate no. 56 (1926), Mary Kortlever Burgraff; Washington State Vital Records, Olympia, Washington. 3. 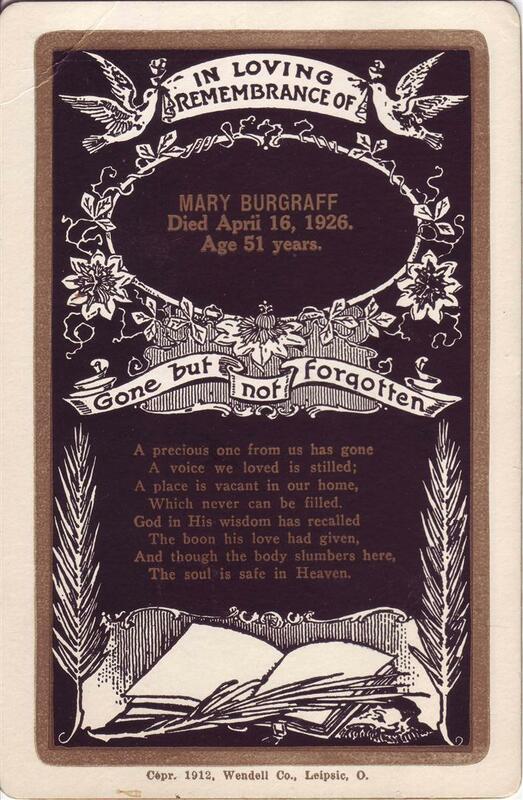 “Hold Services for Late Mrs. Mary Burgraff,” (Lynden) Lynden Tribune, 22 Apr 1926.